Key Difference: White Hat SEO tactics and strategies are those optimization strategies, techniques and tactics that are considered acceptable and ethical by the search engines, especially by Google. Black Hat SEO tactics and strategies, on the other hand, are those strategies that are considered unethical by search engines, i.e. especially by Google. SEO stands for Search Engine Optimization. Basically, it refers to a series of tactics and strategies that are used to increase the visibility of the website in search engines such as Google, Bing, Yahoo, etc., as well as to increase the number of visitors to the website. However, there are a variety of ways thorough which this can be achieved; some are very popular, whereas others are looked down upon. These strategies are categorized into three primary categories, White Hat SEO, Black Hat SEO, and Grey Hat SEO tactics. Each one is different. White Hat SEO tactics and strategies are those optimization strategies, techniques and tactics that are considered acceptable and ethical by the search engines, especially by Google. These types of strategies focus on actual human audience, rather than just machine generated numbers. These strategies completely follows search engine rules and policies, hence the name, white hat, similar to the context white collar. 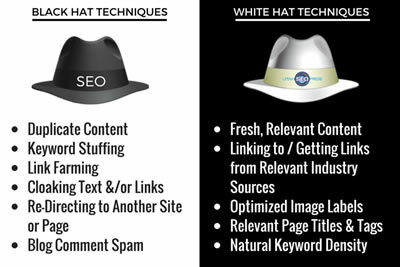 White Hat SEO tends to focus on relevancy and organic ranking. It tends to utilizes strategies such as using keywords and keyword analysis, backlinking, link building to improve link popularity, and writing content for human readers. White Hat SEO is also referred to as Ethical SEO. Black Hat SEO tactics and strategies, on the other hand, are those strategies that are considered unethical by search engines, i.e. especially by Google. These types of strategies do not focus on actual human audience but instead are just focused on improving their numbers, regardless of whether or not those numbers actually correspond to an audience. Specifically speaking, black hat SEO refers to the use of aggressive SEO strategies, techniques and tactic that focuses only on search engines and how they rank websites. They aim to cheat the system so that they can rank faster and better. Some examples of black hat SEO techniques include keyword stuffing, invisible text, doorway pages, adding unrelated keywords to the page content or page swapping, which refers to changing the webpage completely after it has been ranked. These strategies do not work for long and are often always caught, as the search engines are often optimizing their algorithms, which negate the work of Black Hat SEO. Black Hat SEO is often used by people who want to make fast money, rather than actually develop a website or brand. Black Hat SEO focuses on getting the website ranked as fast as possible, as high as possible, and to make as much money as possible, before Google catches on and changes its algorithm. People who aggressively utilize Black Hat SEO may also find themselves getting removed from the search engine rankings completely, or getting blocked from AdSense and Adwords if they utilize those. Also, this ban could be for a lifetime as there is no guarantee that they will ever relist the offending website. Grey Hat SEO refers to SEO strategies which utilize a combination of white hat and black hat SEO practices. While this may sound like a good bet, i.e. the best of both worlds, it is still not recommended, because black hat strategies are still black hat strategies, even if they are used in combination with white hat strategies. If caught using any black hat techniques, even one may result in a negative impact on the ranking and may even lead to getting banned, which will negate all of the effect of the white hat SEO techniques. Search Engines and how they rank websites. Using keywords and keyword analysis, backlinking, link building to improve link popularity, and writing content for human readers.